Roll tide roll. Alabama Crimson Tide Hot Sauce is a premium blend Cayenne Pepper Sauce with officially licensed colors and logo. Show your school spirit and spice up the party with this collectible sauce. Arkansas Razorbacks Hot Sauce is a premium blend Cayenne Pepper Sauce with officially licensed colors and logo. 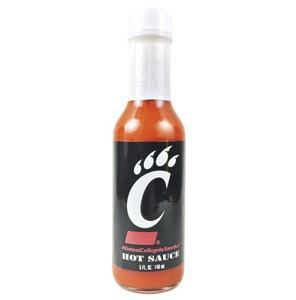 Show your school spirit and spice up the party with this collectible sauce. 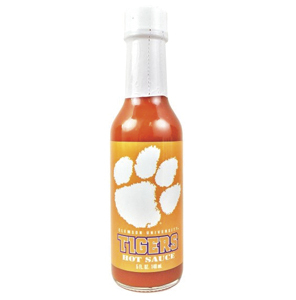 Auburn Tigers Hot Sauce is a premium blend Cayenne Pepper Sauce with officially licensed colors and logo. Show your school spirit and spice up the party with this collectible sauce. 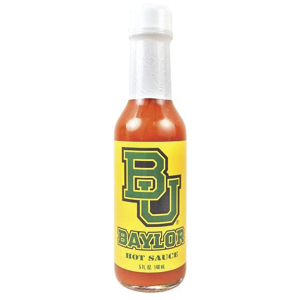 Baylor Bears Hot Sauce is a premium blend Cayenne Pepper Sauce with officially licensed colors and logo. Show your school spirit and spice up the party with this collectible sauce. 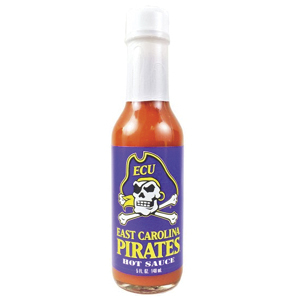 East Carolina Pirates Hot Sauce is a premium blend Cayenne Pepper Sauce with officially licensed colors and logo. Show your school spirit and spice up the party with this collectible sauce. Go Gators. 2007 National Champs in football and 2006 National Champs in men's basketball. 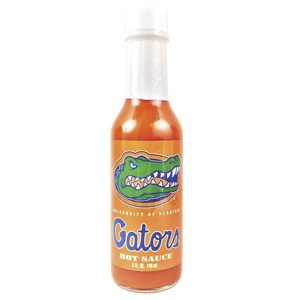 Florida Gators Hot Sauce is a premium blend Cayenne Pepper Sauce with officially licensed colors and logo. Show your school spirit and spice up the party with this collectible sauce. 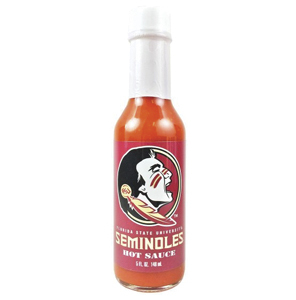 Florida State Seminoles Hot Sauce is a premium blend Cayenne Pepper Sauce with officially licensed colors and logo. Show your school spirit and spice up the party with this collectible sauce. 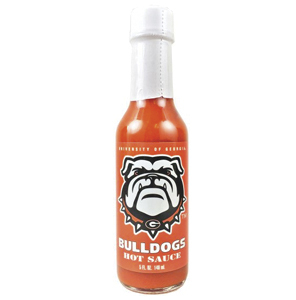 Georgia Bulldogs Hot Sauce is a premium blend Cayenne Pepper Sauce with officially licensed colors and logo. Show your school spirit and spice up the party with this collectible sauce. 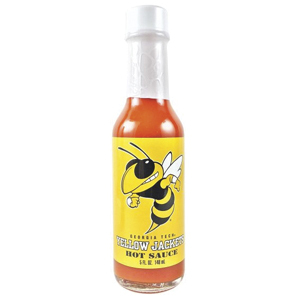 Georgia Tech Yellow Jackets Hot Sauce is a premium blend Cayenne Pepper Sauce with officially licensed colors and logo. Show your school spirit and spice up the party with this collectible sauce. 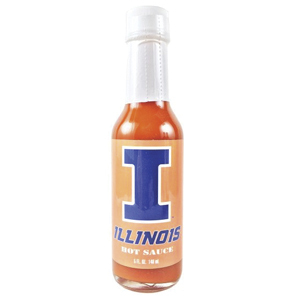 Fighting Illini Hot Sauce is a premium blend Cayenne Pepper Sauce with officially licensed colors and logo. Show your school spirit and spice up the party with this collectible sauce. 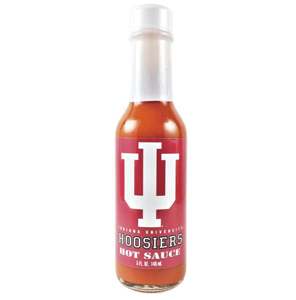 Indiana Hoosiers Hot Sauce is a premium blend Cayenne Pepper Sauce with officially licensed colors and logo. Show your school spirit and spice up the party with this collectible sauce. 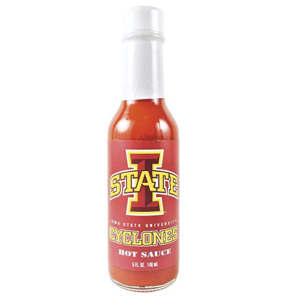 State Cyclones Hot Sauce is a premium blend Cayenne Pepper Sauce with officially licensed colors and logo. Show your school spirit and spice up the party with this collectible sauce. 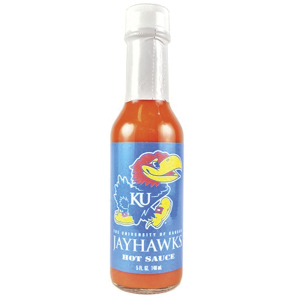 Kansas Jayhawks Hot Sauce is a premium blend Cayenne Pepper Sauce with officially licensed colors and logo. Show your school spirit and spice up the party with this collectible sauce. 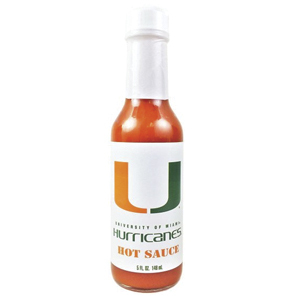 Miami Hurricanes Hot Sauce is a premium blend Cayenne Pepper Sauce with officially licensed colors and logo. Show your school spirit and spice up the party with this collectible sauce.